After three decades of long-distance running, Colin’s bones are no longer up to the impact. He started cycling and for three years he has only been riding his steel-frame, single-speed Qhubeka bicycle on which he has logged 30,000 kilometres. 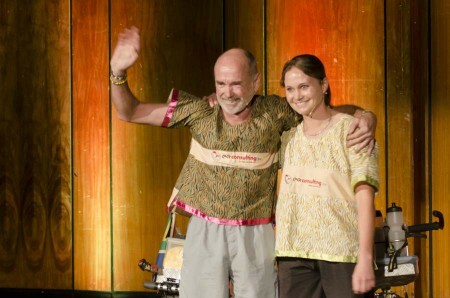 Colin, with his daughter Bianca, has completed five ‘back-to-basics’ Qhubeka expeditions. “We hope to do many more,” he says. Forced by her parents to spend as much time on outdoor activities as possible, Bianca has developed a strong ability to be able to look after herself in tough circumstances. Bianca works extraordinary hours as an Emergency Unit Doctor and Regional Manager for ER Consulting. When not riding her bike she can be found riding her horse, Franc. Bianca, together with her sister Lene, maintains their website (www.heavymetalbikes.co.za) and, like her dad, she likes REAL beer, red wine, cheese, peanut butter and proper bread.